February was Black History Month, but in StepUp’s Children’s Program, we celebrate it every month because we see history in the making every day. We attempt to expose every child to something new in our program. In celebration of black history, most of our children have done projects at school, and some even participated in after school shows. My challenge for each of my students was to find a particular person in history they have never heard of and research their contributions, inventions, or discoveries. One of our children took it to another level and participated in a Black History show at her school. Lleya Curtis is active in many things like dance, cheerleading, and art. I had the chance to watch this fabulous young lady bring history to her school. I believe it is important to teach our young people that no matter what you do, always do your best. Lleya did a great job representing Black History Month through dance! January has been a month of great change in the nursery on Tuesday nights! We had quite a few little friends graduate in December, and we are excited to see them begin a new chapter in their lives. With the start of the new phase, we also welcomed a lot of new faces to the nursery as well. We had not only new children join the program, but also a few new volunteers as well. It has made the first few weeks very busy and exciting all at once. The first night of the new phase, we had over 15 children between ages birth-5, which was wonderful. We were able to split into three different age groups during the night, and have volunteers and staff take advantage of having multiple rooms to use at White Memorial, which has made all the difference. Please reach out to us if you would like to join this growing bunch and volunteer with the nursery! This month the kids at StepUp had the opportunity to participate in cultural day, which is an event that we have once a year giving our children a chance to learn about a culture that they may not be familiar with. Our guest speaker this year was Farah Campbell; she came and shared her Haitian heritage with the kids. Both of Farah’s parents were born and raised in Haiti and later moved to the United States to raise their family. The Kids had the chance to see the Haitian flag and see where Haiti is located on the map. They learned about traditions and some of the many festivals that are held in Haiti. Farah taught them a few useful phrases in Haitian Creole such as “Sa ki pase” which means, “ What’s up?” and “Bonswa” which means “good evening”. The kids also got to move around a bit and learned a traditional Haitian dance while listening to some music. They had the opportunity to try fried plantains which are very popular Haitian dish. It was a night filled with learning and exposure, and the kids had a great time! This month in the Children’s program we had one of our Police Officers come and talk about what she really does on her job. We thought that having her come and talk to our children would be a great way for them to ask questions and share some of their stories with her. Some of our children even shared that they want to one day become an officer. Officer Delva did a great job with showing our children the different roles that many officers have. She even talked about the Officer who pulls us over for speeding! Volunteer? Care giver? Rock star. Bonnie Whitehead, has been a volunteer with the Sunday school at her own church, and jumped at the opportunity to help another group in the nursery setting. She was first introduced to StepUp back in June of 2011, and is now going into her third year of volunteering with us. Bonnie loves to get the chance to work with a child one on one, since that really gives you a glimpse into their own world. She loves to learn their interests, likes, and dislikes, so she can better adapt to their needs. We thank Bonnie, and all of our wonderful volunteers for helping to enrich the lives of our participants, both young and old. We could not do it without you! On Tuesday night in the children’s program we spend a portion of the night doing homework or something academic. This generally looks like kids sitting around the tables with the help of our wonderful volunteers working hard on homework, reading books, or challenging themselves with flash cards or trivia. One of our phase one participants challenged the norm this week by letting us know that the only homework he had for the night was to practice his clarinet. Shawn is new to StepUp and had already started to make a good impression with our staff and volunteers. He is a 6th grader who has a love for music as well as talent. One of our volunteers went and sat outside in the Courtyard so that Shawn had the opportunity to work on his homework during this time as well. Our children in Little Steps are constantly learning and growing. This month, they worked on name recognition using ice cream. The children really enjoyed adding the scoops to the ice cream cone and then counting how many scoops they had according to the letters in their name. The kids had so much fun, while also gaining important skills they will need. StepUp Ministry partners with several different organizations and we have the honor to have them work with our children. This month we started our unit on personal health and nutrition. POE Center has been coming for several weeks teaching our children about nutrition and how to live and maintain a healthy life. Our children are not only learning how to eat healthy, but they are also learning how to exercise and stay active. Our children are very active and they love when POE Center prepares different games and exercises for them! Amonte’ comes to StepUp on Wednesday night at Christ Church. Amonte’ is four years old and he is full of energy. He enjoys playing ball with the volunteers and he gives the best hugs! One week our lesson was on feelings, so we discussed the different ways we feel. Amonte’ gave us a list of things that made him happy and named a few things that sometimes make him sad. He expressed that playing football makes him very happy. 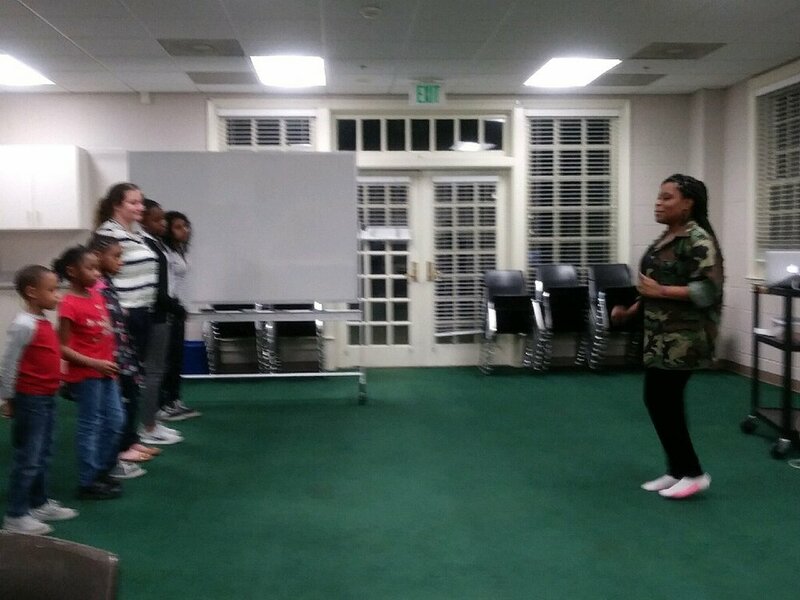 We are ecstatic to have Amonte’ in our Children’s Program. Our children got a special treat last Saturday, getting to tour the 2017 Annual Blacks in Wax Live Museum. The Museum, presented annually by the African American Cultural Center, in collaboration with AYA Ambassadors, allows moments from African American history to come to life. The kids loved seeing and hearing the stories of figures like Malcom X, Emmitt Till, Rosa Parks, and others. The proceeds from the event this year were given to support the work we are doing at StepUp Ministry. After attending the live Museum the kids had the chance to get a glimpse of college life by wandering around NC State's beautiful campus and having lunch in Fountain Dining Hall. Overall a good day was had by all and we look forward to having more events in the near future. As of January 4th, StepUp has restarted the children’s Program at Christ Church, and with a couple of weeks under our belt we are off to a great start. We have a really great group of kids who seem to be enjoying the program so far. We are looking forward to watching them develop and learn over the course of the next year with us! We asked one family their opinion on the program so far and the mother said they are having a great time and getting a lot from it already! She also mentioned that her kids beg her to bring them every week. It’s feedback like this that makes it all worth while! Step up Ministry had the opportunity to partner with White Memorial for the Haiti project. The Haiti project allowed us to help provide for 500 kids who live in Haiti. On Tuesday Night there were items such as toothbrushes, toothpaste, bars of soap, hand towels and wash cloths, combs, nail clippers, band aids and small toys. The children in our program were able to fill one zip lock bag with each of these items. It is important for our children to understand what it means to give back to the less fortunate. It also gave our children the opportunity to learn more about Haiti and to ask questions. They were very excited and grateful to help make 100 zip lock bags of healthy items for the kids in Haiti!